A deserved home victory for Racers in the penultimate home match of the season, coupled with draws for the leaders and third-placed Atherstone, put a different complexion on the table ahead of the trip to Heather on Saturday. Henry Leaver produces a perfectly timed challenge. 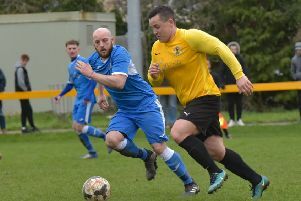 And Easterlow says he is determined to crank up the pressure on the long-time leaders who round off the season with tricky fixtures against Uttoxeter, Studley and Atherstone after facing his side. “What added gloss to our win this weekend was that both Heather and Atherstone dropped points,” he said. “With all that in mind we should bounce into this weekend’s massive game now against Heather. “It’s a must-win game for us really and if we can get the three points that would put us five points behind with a game in hand. “So hopefully we can doa job on them this weekend coming and see if they can handle the pressure. 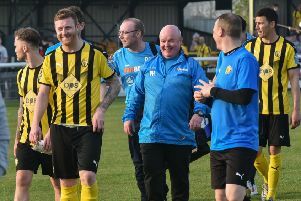 “Five games to go and we will be going all out to win them all and secure a promotion for this football club, the first for a very long time and one that the club needs. Ben Mackey’s 29th and 30th goals of the season helped secure back-to-back wins for Racing Club and Easterlow said the importance of the last-minute winner at Chelmsley the previous week could not be understated. “We played some good stuff Saturday as predicted. “I think the win last week seemed to give us the confidence to get the ball down and get back to playing the way we have for most of the season. The home side made an explosive start with Joe Smith heading home in the second minute. The dangerous Sean Brain equalised for Studley in the 13th minute, smashing the ball home after Charlie Bannister could only push out a shot. However, Mackey restored the lead ten minutes later, producing a fine half-volleyed finish to round off a great Racers move. Mackey added his second of the afternoon and his 30th of the season when he prodded home in the 42nd minute and Danny Bartle added a fourth eight minutes into the second half after good work from Mackey. It was looking like a drubbing but Studley regrouped and Brain reduced the deficit, latching on to a long ball and coolly slotting home.